QUEZON CITY, Jan. 1 (PIA) -- Landless, poverty-stricken farmers stand to benefit from the assistance being extended by the Department of Agriculture (DA), a statement from the agency said Sunday. This, after the DA committed to properly train these farmers in order to generate additional income for themselves, while at the same time, help boost food production in their areas. “They’ll be trained and organized into service provider groups,” Secretary Proceso Alcala emphasized. include the building of paddy dikes, repairing of irrigation canal, desilting, plowing, replanting and harvesting. DA is already jump-starting the scheme’s implementation. 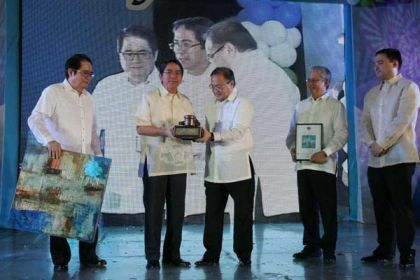 “We started work on the service provider scheme for coconut replanting and fertilization as well as for repair and desilting of irrigation canals,” Alcala said. The replanting and fertilization work is among Philippine Coconut Authority’s interventions to boost the country’s coconut industry. Alcala is optimistic that DA assistance will help the groups bag farm-based work contracts backed by guarantee in terms of quality and competitive pricing. “Management and marketing will be important add-on components of the groups to enable these to solicit enough jobs,” he said. DA earlier tapped landless farmers to build in Northern Samar province paddy dikes about 650 meters long. Eight workers’ batches, each composed of 50 farmers, undertook the work using tools DA provided for this purpose.